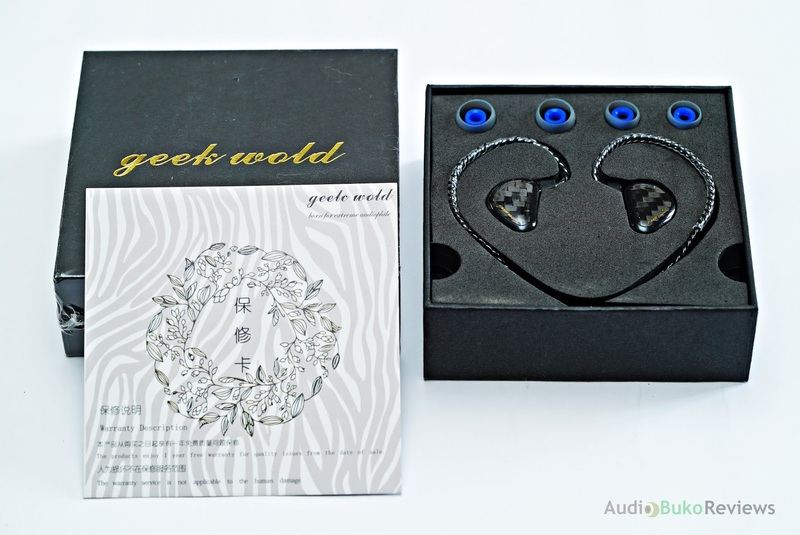 Introduction: Geek Wold is a new Chinese brand that recently came into the audiophile sphere with a fast promotion to production of their first IEM project called the GK3. This shouldn't be surprising as their history includes being an original design manufacturer (ODM) of high end audio ear gear for other companies, which should give them the experience and know-how to easily make their own products now that they've started their own brand with the tagline "born for extreme audiophile". I would like to thank Geek Wold for providing me with a review sample in exchange for an honest and unbiased review. You can buy the Geek Wold GK3 at Penon or locally if your retailer has them in stock. The major eye catching specification on the GK3 is it's 3 dynamic drivers and the idea that each will specifically play only the frequency it's assigned to, leading to a better separated and (ideally) balanced output. Even with 3 dynamic drivers in it, the GK3 is delightfully easy to drive and is very listenable even on my Xperia at 10/15 volume. 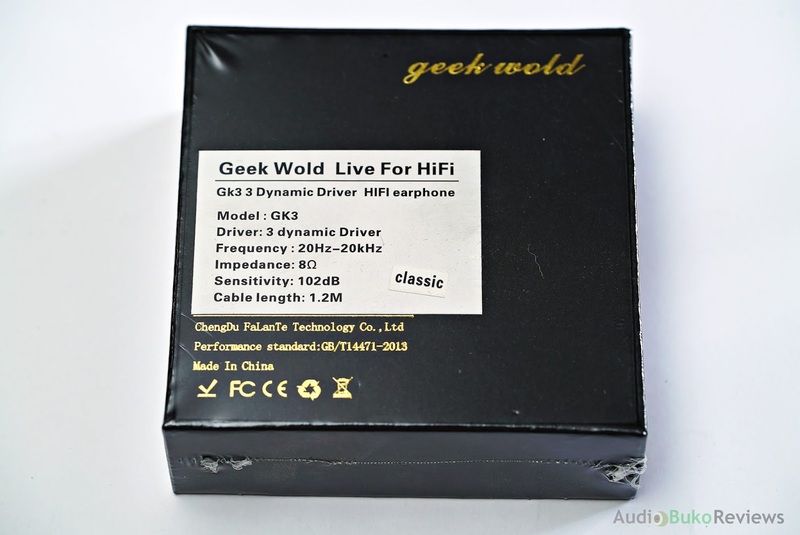 Unboxing: The Geek Wold GK3 came in a tightly fitted black cardboard box with minimal branding in gold, and only basic information with no graphics on it. It's a simple yet effective package which doesn't distract you from what you're really after. Inside you'll find a warranty card, the GK3 and 2 silicone ear tips, the 3rd pair is already attached to the GK3 and that's it, on par for the price. 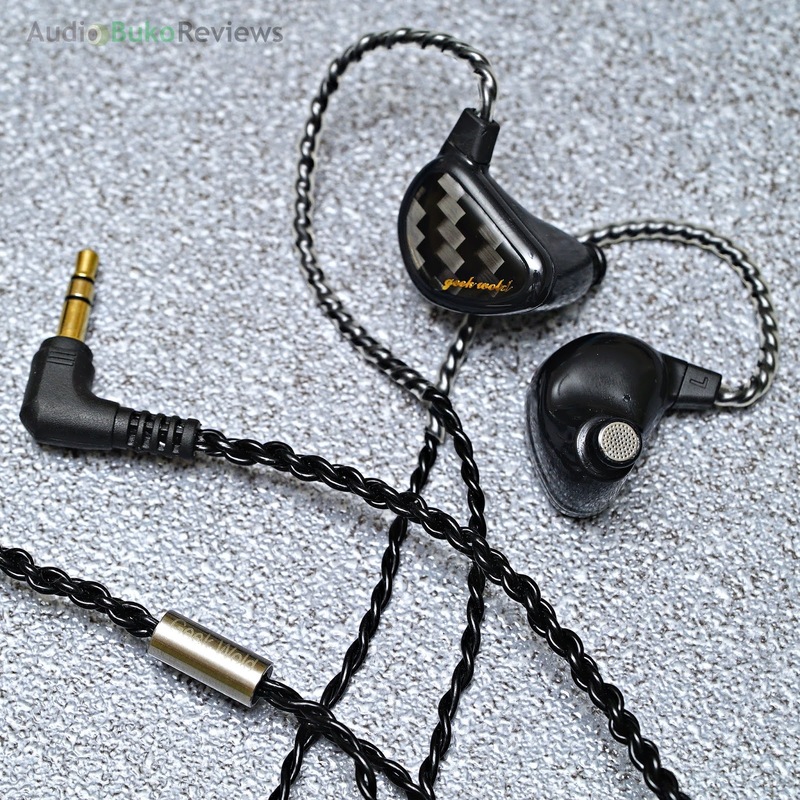 Cable/Build/Design: The Geek Wold GK3 is a simple yet beautiful looking IEM, the 3.5mm plug is gold plated with a standard right angled design, has adequate strain relief, the splitter is a metal tube with the Geek Wold branding, with no chin adjuster. The cable itself is a black TPU coated 4 core wire that feels soft and a bit springy but pretty good and tough. 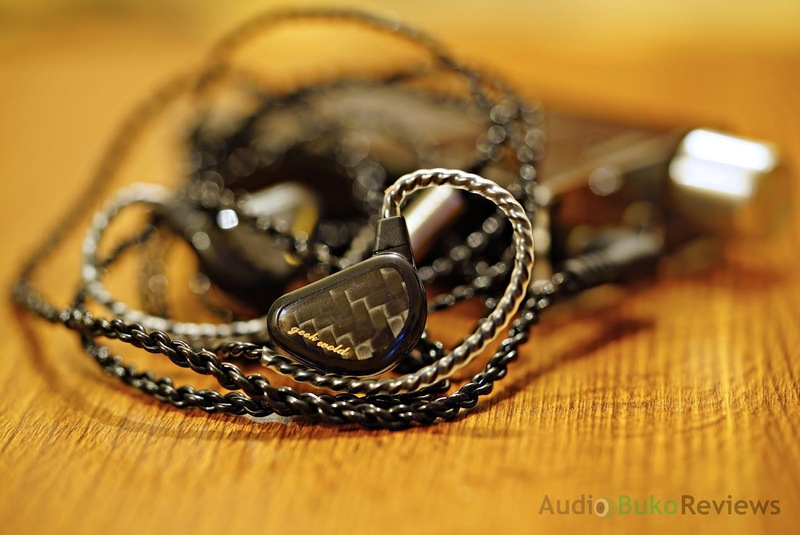 The IEM itself is permanently attached to the cable and it has adequate strain relief and a molded transparent coat to help wrap the cable over the ear. The shell is something more than what you'd expect at $20 usd, the shell is light but does not flex, it has a hole near the inner side for preventing driver flex. 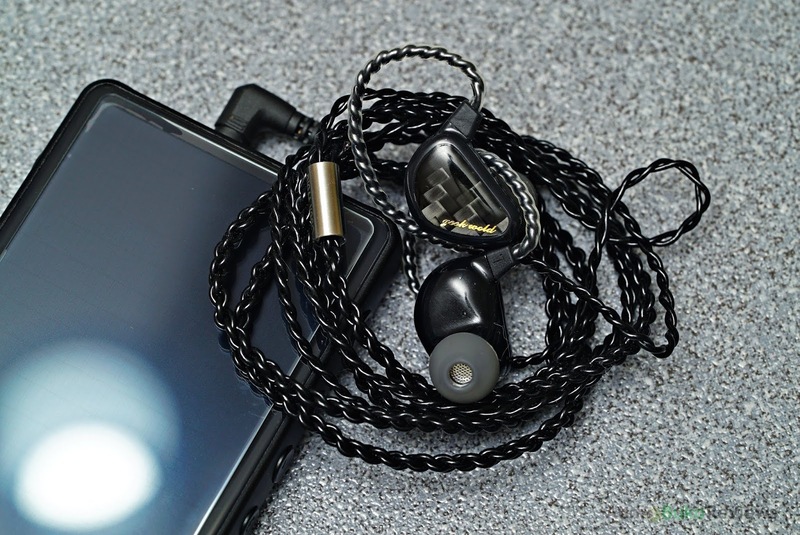 The inner side of the shell fits well in my ear even if it has no nubs and bumps to help it stay inside, being light, and with the right tip, the GK3 feels like it floats in my ear be worn easily for long listening sessions. Of course, the main eye candy on the GK3 is the shiny carbon fiber faceplate covered in clear acrylic with the beautifully inscribed brand of Geek Wold in gold. 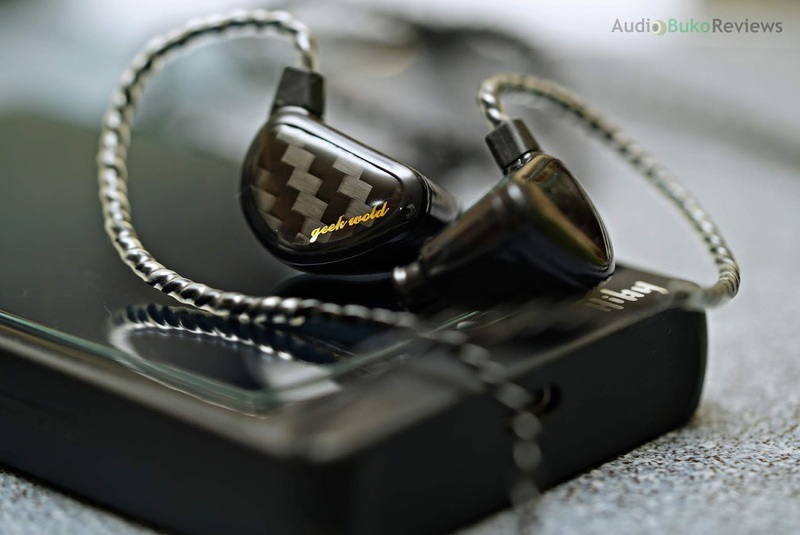 Sound Analysis: There was considerable hype with the Geek Wold GK3 when news first came out, a rarely done three dynamic driver IEM with an affordable price tag gave hope for those seeking a viable alternative to the more pervasive and popular budget IEMs around. After a brief warm up of the GK3, I felt that it had a warm and upbeat sound with good separation with at least the 3 main frequencies thanks to 3 separate drivers. After 200+ hours of playing music through it, I'm ready to hear any changes and convey to you gentle readers how this budget star performs. The Geek Wold GK3 was tested using the stock tips and several sources. Bass: The GK3 reaches a good depth with regards to sub-bass and has a lot of it as well. In Way Down Deep, the depth is satisfying and makes you feel the hit and reverberation of each drum beat. Speaking of hits, Cheap Thrills bass beats hit quite strongly and smoothly, something you'd normally expect from a good dynamic driver. The bass decay on the GK3 is a bit below average in speed which helps give music a good and enjoyable rumble which doesn't hinder the overall resolution of a song. Mids: The lower mid range of the GK3 sounds a little laid-back, with male vocals sounding a little thicker and smoother overall. The upper mid range is a little bit boosted which gives female vocals a more forward position and aids in the level of it's intimacy. There is an average amount of detail and transparency here which contributes to an overall good sounding warm mid range presentation. Treble: There is a good amount of extension here, giving the GK3 a near natural sounding treble. Silent Lucidity's acoustic guitar plucks sound a little thicker than normal with a hint of crispness to it, but it's free from any harshness and sibilance. There's an average amount of air and detail which helps give an emotive yet uncluttered treble that sounds smooth but also a little exciting. Soundstage: The horizontal stage on the GK3 sounds average with the music sounding a bit in the ear but can reach a inch or two outward. The vertical depth is rather close, which can cause a bit of congestion on very busy tracks. The overall stage sounds natural if average in terms of capabilities. 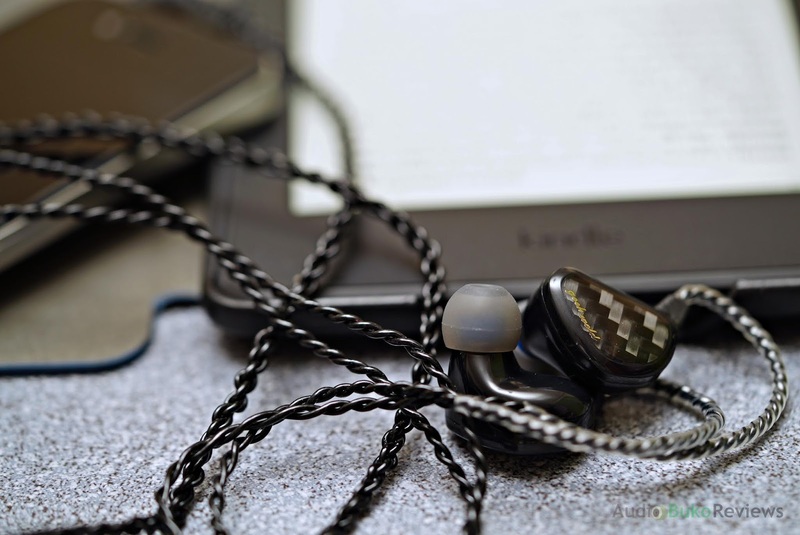 Conclusion: The Geek Wold GK3 is, for the price, a very good choice for beginning audiophiles with it's impressive bass, good highs and an overall engaging performance. On a subjective note though, the mids are technically fun sounding but I prefer a neutral to a more forward presentation but the V shaped signature of the GK3 will definitely appeal to budding enthusiasts and those with a tendency to be treble sensitive. Cons: Lower mids could benefit from being neutrally placed.